Even if the Assembly and Executive were non-functioning from 2002 onwards, it was clear that the peace would last. 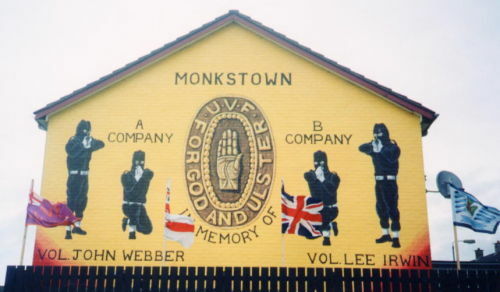 As the peace wore on, the pressure grew on loyalist paramilitary groups to remove paramilitary murals and in particular those showing hooded gunmen. (Previous pages describe how ‘active service’ hooded gunmen were removed from republican murals after 1994 – Visual History 07 and Visual History 08 – and the direction that republican murals went in after the peace – Visual History 09). Visual History 08 mentioned various reasons why loyalist hooded gunmen did not go away in the years between 1994 and 2002: perceiving the Agreement as a threat; uncertainty over the IRA’s resistance to decommissioning; use by paramilitary organisations to assert control over an area (including asserting control by one group over another (loyalist) group); lack of alternative themes. These obstacles were overcome beginning in 2003 with various local initiatives and then in 2004 substantial state intervention began with the “Art For Regeneration” programme from the Arts Council NI and Belfast City Council. In 2005, 2.4 million pounds were allocated to nine borough councils for a variety of projects, including the removal or repainting of murals and installation of sculpture in public places (Arts Council NI Press Release); then in 2006 the Shared Communities Consortium (led by the Arts Council and the Executive) launched the “Re-Imaging Communities” programme, with the 3.3 million pounds pilot programme running from 2006 to 2009 and renewed for 2012-2015. One might expect state agencies to be involved in muraling early and often during the Troubles, as art not identifiable with either sect (including street art and graffiti art/wild-style writing, as will be seen in Visual History 11) reminds people that public art need not be unwelcoming to a person of ‘the other’ sect and need not even reflect CNR or PUL communities. There had been a ‘Community Murals’ programme in the late 1970s involving Art College students funded by the NI Office (see Rolston 1991 chapter 2 and Watson 1983) but the peace-time period has seen a much greater involvement on the part of state agencies (and some NGOs). To state a general principle that will be instantiated many times: if it’s not sectarian, a community won’t bother painting it, only the state will. While historical murals, such as those depicting the Williamite campaign in Ireland (1688, 1690), the rebellions of the United Irishmen (1798, 1803), the mobilisation against Home Rule (1912), the Easter Rising and the Battle Of The Somme (1916), are seen as an improvement over paramilitary murals, they are still sectarian and oppositional. One might think that historical events should be evaluated on a case-by-case basis, but in practice every event that has been represented (so far) has been represented because it is significant enough to one of the sects. State agencies fund works on these themes, as an alternative to the more oppositional paramilitary murals. Similarly, murals on economic life are loyalist and generally understood oppositionally by Catholics, on account of the predominance of Protestant workers and owners and discrimination against Catholics throughout the twentieth century. The primary loyalist symbol of Belfast industry is the cranes Samson and Goliath of the Harland & Wolff shipyards. The construction and sinking of Titanic generally belongs to the loyalist community but there was a H&W/Titanic sinking mural painted in a republican area, at the Giant’s Foot next to Coláiste Feirste (X00661). The only economic theme that appears in republican murals is mill work (M03527 | M04431) though this is not exclusive to republican murals (see M04049). Cultural murals (Celtic myths, Gaelic games, Gaelic music and dancing, flute bands from both sects) are less oppositional: they can function as positive expressions of one sect’s culture, especially when viewed by people internal to the sect, but when viewed by outsiders, they often function oppositionally when the culture of one sect is perceived as a threat by the other. Team sports serve (all over the world) as a proxy for battle between communities. In Northern Ireland, soccer is the only team sport of note played by large numbers from both sects, and the teams that are best on each side have sectarian as well as rivalrous roles. Thus, the pre-eminent Protestant team, south Belfast’s Linfield, is opposed to both Catholic-supported teams in general as well as to other Protestant teams, such as east Belfast’s Glentoran. There are different leagues in Northern Ireland and the Republic, and thus no chance that Catholic fans might back Linfield as the Belfast team in an all-Ireland cup final or in European competitions. Similarly, the two associations – the Irish Football Association and the Football Association Of Ireland (no, this is not a Monty Python joke) – are represented by two national teams: Northern Ireland and the Republic Of Ireland, respectively. Back at the club level, global media has allowed people to follow their favorite teams abroad. First to mind come the Glasgow teams Rangers and Celtic, which are supported along sectarian lines. Teams from England and further afield might draw support from both Catholics and Protestants, but then … there are, with very few exceptions, no murals to these teams in both areas. Again, the rule seems to be: if it doesn’t identify us in opposition to them, it’s not worth putting on a wall. Individual sports provide little relief. Heroes are mostly claimed by their local (sectarian) areas, though boxer Carl Frampton is portrayed in both Tigers Bay and the city centre, and golfer Rory McIlroy can be found in (non-sectarian) south Belfast and the city centre. In general, scholars have not been kind to the state initiatives, the central criticism being that through the re-imaging programmes state organisations attempt to assert control over the visual environment in a top-down manner, such as by bringing in an outside artist to “enrich the community”; in contrast, public art in communities is most meaningful when it is the expression of a community to the outside world or a message from one part of the community directed internally. Rolston summarizes the re-imaged pieces as being “sanitised, de-politicised” (2012 p. 460); Romens says that the new murals “fail to depict scenes that resonate with local history and community identity” (2007 p. 12); and both Romens and Hill & White (2012) fear that re-imaged murals will go the way of the Northern Ireland Office/Art College murals from 1977-1980. It’s likely that public art in peace-time cannot hope to match the intensity of Troubles art, and this might be a good thing – the art of peaceful societies should be pleasant and perhaps intellectually provocative, but not energising, at least not in a sectarian way. The proper comparison-class for state-sponsored art is perhaps art produced by other societies not in conflict rather the murals currently being produced by communities themselves (much of which is of a piece with Troubles-era art) and certainly not the most striking pieces from the 1980s which are heightened by the drama of their time. At the same time as Troubles-era murals were being changed to reflect the peace, that same peace made it safe for tourists to visit the murals but of course the tourists were primarily interested in murals relating to the struggle. This is called “dark tourism” – the visitor achieves the thrill of danger without being in fact endangered – or “Troubles tourism”, in reference to Northern Ireland specifically. Some efforts were being made locally from 2003 onward. In east Belfast, Rev. Gary Mason worked with local paramilitaries to remove hooded gunmen (CSMonitor, cited in Rolston 2012 p. 453), replacing ‘UVF Still Undefeated’ (C01050) with footballer George Best (J1969) and ‘RHC Red Branch Knights’ (J1932 no image) with local author CS Lewis (J1919). Other local initiatives were taking place in Craigyhill (Larne), Bangor, The Factory (Larne) & Ballycarry (references from Lisle 2006, p. 51 n. 41.). a few were the names, emblems, and mottos of the UDA, UFF, and UYM (one tying together “Scotland – Ulster” C01469); one (shown below) was historical, linking the current UDA to the UDU, though it centrally depicted a hooded gunman who always seemed to be aiming directly at the viewer; a few were straightforwardly of hooded gunmen, such as the example second below; there was a version of Eddie; and finally one with Spike (the dog from Tom & Jerry) brandishing an assault rifle and chasing Gerry Adams up the Shankill Road (C01472). By 2004, state agencies were beginning re-imaging attempts. The Housing Executive formed a ‘Community Cohesion Unit’ which in one instance joined together with Belfast City Council’s ‘Greater Belfast Mural Project’ to replaced UVF murals in the Village (Rolston 2012 p. 453). In February 2004, a 2.4 million pounds, lottery-funded, “Art of Regeneration” programme was announced by the Arts Council in conjunction with the NI Department of Culture, Arts, Leisure, distributing money to Borough Councils (Craigavon, Derry, Moyle, Ballymoney, Antrim, North Down, Strabane, Fermanagh, Newtownabbey – 85% of funds allocated outside Belfast) for art-related projects of various types. Here is an account of a sculpture supported by Ballymoney Borough Council; mural removal projects took place in Kilcooley (Bangor) and Loughview/Redburn in Holywood (Hill & White 2012). “Women of substance – Plúr Na mBan”. Another New Belfast initiative, this time in the (republican) Markets area. (2005 dating to 2004 M02356) See also Tar Liom I Mo Dhiaidh (2006 M03335). 2006’s ‘Re-Imaging Communities’ programme brought together the Arts Council (which oversaw the project), Office of the First Minister and Deputy First Minister, the Department for Social Development, the Department of Culture, Arts and Leisure, the International Fund for Ireland, the Northern Ireland Housing Executive, the Community Relations Council and Solace, the Society of Local Authority Chief Executives and Senior Managers, but not Belfast City Council (Rolston 2012 p. 454). The SDLP’s Alban McGuinness suggested it was “a polite form of extortion” on the part of loyalist paramilitaries (NewsLetter). … and four new murals added: Martin Luther (X00301; see also M02382) and three about WWI and II (Enlisting in WWI (X00504) – WWII Blitz (X00502) – WWII VE Day (shown below)) in Dover Place. “Can It Change?” replaced by “Play”. “Ethnic Cleansing” replaced by “Everybody Has The Right To Participate”, shown here with pallets stacked for 11th night celebrations. One of the new murals: Cuchulainn, defender of Northern Ireland. Another of the new murals: VE Day. In Kilcooley (Bangor) a UDA mural with a gunman aiming straight at the viewer was painted out and later (2009) replaced by a mural to local Victoria Cross recipient Edward Bingham. In 2018, however, this mural would be re-re-imaged with a North Down Defenders mural – see Visual History 11. An example of “the gold old pre-Troubles days” is the series of five boards in 2008 about the (republican) Markets area done by artist Raymond Henshaw, with photographs from yesteryear on the themes of Portraits (shown below), Industry, Social History, Sport & Culture, Bars (and a sixth wall showing people). The project was funded by the Arts Council and locally involved the Markets Development Association. In 2009, Henshaw produced a series of tarps for the fencing around a vacant lot on the Shankill as part of the City Council’s Arterial Routes programme. In Glenbryn (north Belfast), a mural putting the Confederate forces of the American Civil War (which it calls the “War Of Northern Aggression”) in parallel with the resistance to Home Rule was replaced in 2009 with a mural of famous faces from the past, designed in collaboration with older residents. It can be seen from these changes that (as mentioned above) the funding agencies prefer images that are devoid, if possible, of any hint of sectarianism, on themes such as the local community (in the good old pre-Troubles days) and global issues such as children’s and human rights. 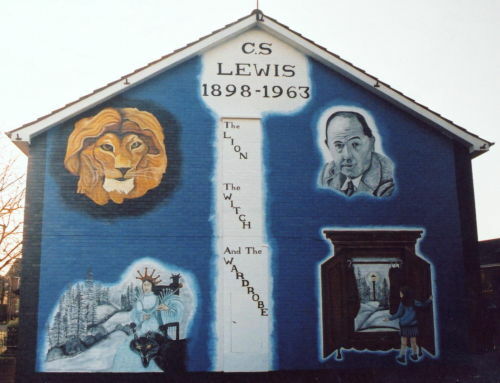 Thus, some of the cultural/historical murals that had earlier replaced paramilitary murals were themselves replaced by murals with even weaker themes, such as the Siege Of Derry mural being replaced by local boxers, and the Ethnic Cleansing mural being replaced by Everybody Has The Right To Participate. Similarly, in east Belfast, a H&W shipbuilders mural (J1913) was replaced by a cross-community poem No More in 2010 (X03411). Agencies were not always successful in getting a non-sectarian image put in place. Rolston (2012 p. 455) reports that the Arts Council thought King Billy was too divisive an image to replace the Village Eddie (both shown below), but lost this particular battle. Rolston (2012 p. 459) describes how the Arts Council demanded the removal of a sword in the hand of the chieftain on the right of the Flight Of The Earls mural in Ardoyne; instead, he was painted clutching the collar of his cloak. At the same time (Rolston continues), funds were allocated to murals with WWI soldiers carrying weapons at the Somme. His explanation is a double-standard on the part of the Arts Council: “The demarcation line between militant republicanism and the state is rigid and cannot be transgressed, even artistically. 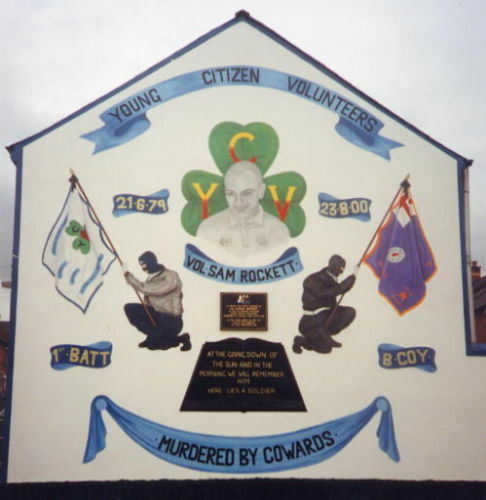 But that between militant loyalism and the state is more porous, allowing official and illegal iconography to coexist, even if not acceptable to all.” Why the Arts Council should decide in this way is unknown; it was perhaps willing to go make greater compromises in the case of loyalist murals in order to get rid of hooded gunmen. Rather than being completely excluded, loyalist paramilitarism sometimes occurs alongside British forces from WWI. In the memorial garden in Kilcooley, Bangor, which cost 74,000 pounds, the recessed panels beside the gate and in the back wall are of WWI, while the three standing stones – added after completion – are to UDA, RHC, and UVF volunteers. Similarly, plaques to contemporary volunteers were added below a Thiepval Tower board in Pine Street. … soccer: George Best was a favourite of funding agencies because his time at Manchester United and world-wide prominence made him a candidate for a non-oppositional figure. Generally, he appeared in loyalist areas – e.g. Blythe St shown below| Portadown shown below – but his name was included in a ‘welcome’ mural in the New Lodge (WP). NI Football (M03499 | M03638 | M04203 | M05824 Sandy Row | M07752 Broadway | Times Bar shown below). Local and Scottish teams. Local football is semi-professional, so fans also follow Scottish and English teams. Of Scottish teams, the favourites are the two Glasgow teams, Rangers (supported by loyalists) and Celtic (supported by republicans). 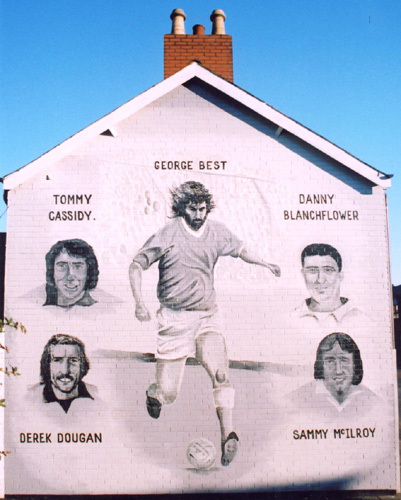 The George Best mural in Brownstown Road, Portadown, replaced a Billy Wright mural (J0320). Glentoran is the east Belfast rival of (south Belfast’s) Linfield. Rangers ‘Ready’ mural in Portadown. “The Ulster Connection” – this east Belfast mural lists local players who have played for Glasgow Rangers. Smaller and not-particularly-successful teams serve only the functions of local rivalries or even just local pride, such as Albion Swifts in the Markets. A Belfast Celtic mural will appear in 2010. The only economic theme that appears in republican murals is mill work (M03527 shown below| M04431) though this is not exclusive to republican murals (see M04049). Additional Ulster-Scots murals were painted (see Visual History 08 for the introduction of Ulster-Scots murals in 1999): 2002 Andrew Jackson (X00285) | 2002 Ulster Sails West (M03568) | 2002? Hame Is Whaur Tha Hairt Is (J1299) | 2002 Roosevelt (New Mossley) (J1600 M09074) | 2004? Roosevelt (Seymour Hill) | 2005 USA Emigration (Bowtown) (A0198) | 2005 Confederate Leaders & Ulster Covenant (Glenbryn) (see above) | 2007? Ulster Scots (Harryville) (M03572) | 2009 Emigration (Bowtown) (A0333). And later: 2016 Discover Ulster Scots 13 panels (York Street) (one | two | three | four | five). To repeat from above: despite these attempts at re-imaging and the emergence of additional themes, many murals of hooded gunmen continued to exist and to appear anew. As on the republican side, some murals are memorial to fallen comrades, such as this RHC mural and plaques in the old Hunt Street, east Belfast. But many are of hooded gunmen in “action” poses, such as this “UFF Dee St Coy” mural in east Belfast. UN Day For The Eradication Of Poverty (Dunlewey St). The mural make reference to child poverty in “W. Belfast” which would include the Shankill and Woodvale. However, the Celtic imagery might be understood oppositionally by loyalists. West Belfast Taxi Tours. Only one of these murals was in fact still visible in 2003. Tourists are encouraged to write a “message of peace” on the “peace” line and as a result the entire wall is covered in black marker, despite signs asking visitors to “Please respect artwork“. Locals perceive these as patronising and attribute a simple-minded understanding of the situation to tourists. The main “peace” line along Cupar Way is also a stopping point for street artists and wild-style writers from around the globe. This (unknown) artist was realistic enough to draw a security camera in the top left corner, keeping a eye on the people with peace and love balloons. As everywhere along the line, the piece is covered in tourists’ signatures.